This might be a cool SUV after all. We've been hearing that Chevy had plans to bring back from the company's history: the Blazer, cleverly teasing us by showing a guy . But now the long-awaited SUV is finally here. The 2019 Blazer will join the Chevy SUV lineup which already includes the Trax, Equinox, Traverse, Tahoe, and Suburban. So where does the new Blazer fit it? Chevy says it will sit between the Equinox and Traverse, and offer unique design elements for customers seeking a combination of style and utility. The Blazer certainly looks aggressive - a bit like a Camaro at the front. Chevy has styled this new SUV with a wide stance, tight proportions, and a high beltline to help give it an athletic appearance. “The Blazer has attitude,” said John Cafaro, executive director, Global Chevrolet Design. 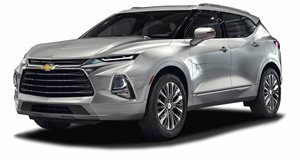 “It looks commanding on the road, while fulfilling the promise of versatility at the heart of every Chevy crossover and SUV.” Each trim level will offer a unique look. The Premier trim features bright chrome while the Blazer RS sports a more sinister blacked out appearance. No matter the trim, the Blazer will be a unique SUV. Two engines will be offered - a 2.5-liter inline-four rated at 193 horsepower and 188 lb-ft of torque and a 3.6-liter V6 with 305 hp and 269 lb-ft of torque. Both engines will be mated to a nine-speed automatic with FWD. On RS and Premier trims a twin-clutch AWD system will be offered that optimizes traction in poor weather and can decouple the rear wheels to operate as FWD for better fuel economy. Max towing on the V6 model is estimated at around 4,500 pounds, and an available hitch view system will help drivers attach their trailer. The system uses the rear view camera to make hitching the trailer a one person job. The Camaro inspiration isn't just contained to the front fascia. On the inside, the Blazer looks remarkably like the current model and has some great luxury features. The Blazer packs seating for five with 64.2 cubic feet of max cargo space with the second-row folded flat. The rear seat can also slide to give occupants more leg room and a cargo management system helps to brake up the trunk area. Available options include a panoramic sunroof, heated steering wheel, heated and ventilated front seats, heated rear seats, key fob activated comfort-open windows, adaptive cruise control, rear camera mirror, hands-free liftgate, wireless charging, and six USB ports. No matter what trim you buy, all Blazers will include an eight-inch touchscreen infotainment system with 4G LTE Wi-Fi and Apple CarPlay and Android Auto. Chevy says the Blazer will be available early in 2019. Pricing will be announced closer to production.